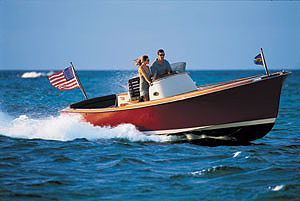 The Navigator 57 Rival bears the proud hallmark of three generations of family owned boat building excellence. Navigators are classically designed yachts built by the finest craftsmen with the highest quality materials. Navigator Yachts are not just safe, elegant, low maintenance but solid investments. "State of Mind" is a beautiful yacht that has been well maintained. 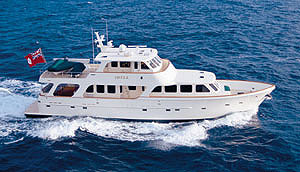 If you're looking for a luxury yacht to live aboard, cruise the islands or conquer the Great Loop look no further. 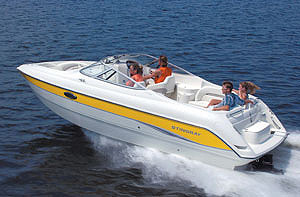 This yacht comes with a transferrable live aboard slip in the beautiful harbor of downtown St. Petersburg! Call to Make an Appointment Today!!! The Navigator 57 interior is accessed through double sliding glass doors located off the spacious aft deck. The salon, galley and pilothouse were designed to provide the owner with a spacious yacht to comfortably live, entertain and cruise aboard. The interior décor gives the yacht an elegant, warm and luxurious feel. The entire interior was recarpeted Along the starboard side of the MAIN SALON is a leather L-shaped settee with a beautiful cherry wood coffee table. Cabinets line the port side of the main salon offering an abundance of storage space. On the aft wall is a custom cabinet that contains the Bose Surround Lifestyle Entertainment System. Moving through the salon and up two steps is the GALLEY/PILOTHOUSE. Opened to the main salon the GALLEY layout is perfect for preparing meals and enjoying your guest at the same time. The galley is well equipped with Corian countertops, double stainless steel sinks, full-size refrigerator/freezer, electric three burner stove, microwave and numerous cabinets for storage. 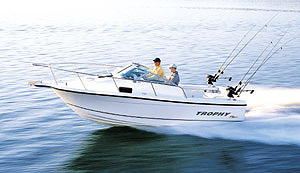 The PILOTHOUSE will please any captain. The large windows offer good visibility, while the helm station is well situated with easy access to all electronics from the captain's leather chair. To port is a Corian dining table with a wrap around leather settee. 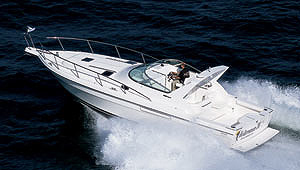 To starboard is a single sliding glass door leading to the foredeck. 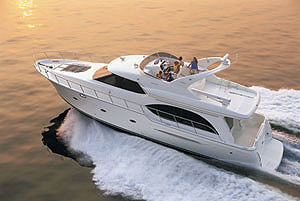 The FLYBRIDGE is accessed from the pilothouse. This space offers great visibility while cruising and a lovely place for entertaining. The two person helm seat provides a 360 degree panoramic view for the captain. The upper helm station has a complete array of electronics. There is an abundance of seating for guest along with a wet bar for making beverages. Aft of the radar arch is the hydraulic dinghy crane and dinghy cradle. Below deck accommodations include three staterooms and two heads all of which have new carpet. The GUEST STATEROOMS are accessed from the pilothouse. Going down a flight of stairs, the first stateroom is to port and houses two bunkbeds. Across from this cabin is the guest head with full shower. Continuing forward is the primary guest stateroom with a large berth, hanging lockers and tons of storage. The stackable washer/dryer is located at the bottom of the stairs in a designated closet. The VIP STATEROOM has its own private entrance in the forward starboard corner of the main salon. This cabin is exactly what you would expect from a yacht of this size. Upon entering there is a nice vanity/desk to starboard, located in the center of the cabin is the large walk around queen size bed with a custom inner spring mattress. The port side is lined with cabinetry for storage. The master head is quite large with both Corian countertops and flooring, a large stand up shower and vanity.